“I just witnessed the most amazing thing on the way here this morning,” my graduate school friend said to a group of us on the second day of the conference we were all attending in Portland. She had a gleam of wonder in her eyes as she described her AM commute. A female bus driver had sang a ballad over the loud speaker to all the passengers on board. When she finished the final note everyone clapped and cheered. The driver was in such good spirits, my friend said, that when she pulled up to one of the transfer stations she took the stage again and quipped over the speakers about the available color-coded MAX options. “Blue, red, yellow, green—takes you to your dream!” she chimed. Six years in New York City and I never once heard any MTA employee singing as they were working, much less be applauded for such a performance. That Portland bus driver truly loves her job. Either that or she’s so bored with it that she made the situation better for herself (and everyone) through her lovely voice and positive expressions. My friend's story is just one example of the spirit of Portland and the delightful experience I had taking the Trimet public transportation system around the city. 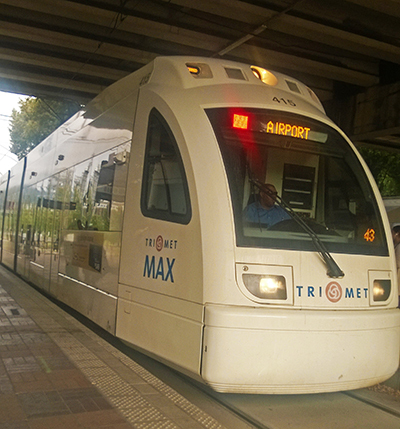 During my stay, the MAX light rail and bus system were my primary modes of travel. There was no crowding or sardine-packing like there is on the buses and subways in NYC. There were no obtrusive advertisements other than for the Trimet's own. People with bikes, luggage, or strollers could easily store their items in cleverly designated racks. Everything was clean and timely. Stop communications and updates were clearly announced over the impeccable speaker systems. Best of all, passengers were quiet and pleasant to each other. They consistently greeted the bus drivers when they hopped on and thanked them when they hopped off. It's no wonder that Portland's Trimet was rated the #1 public transit system by Travel & Leisure magazine several years in a row. We hopped on and, without even a glance at our tickets, he said, “Sorry about the late bus! Where you headed?” We told him we needed to catch the Portland Spirit by 3:00 at the waterfront. The driver jumped into the chair, displacing the hire he was coaching, and decided to take us along our route. He just had to pick up passengers along the way. “I think I can still get you there on time!” As he drove along, he chatted with us the whole way about our trip and the sites we had been checking out. He gave us a whole bunch of tips on breweries to visit, hiking adventures to go on, and nightlife to check out. Through the kindness of this stranger, we basically received a free ride and a 15-minute guided bus tour of Portland. To top it off, we made it aboard the Portland Spirit just as the captain was warming the engines.